Far from the madding crowd in blissful serenity, enjoy a Romance under Canvas Package at a Sabi Sands Safari Lodge, where your special holiday can unfold in the wild. 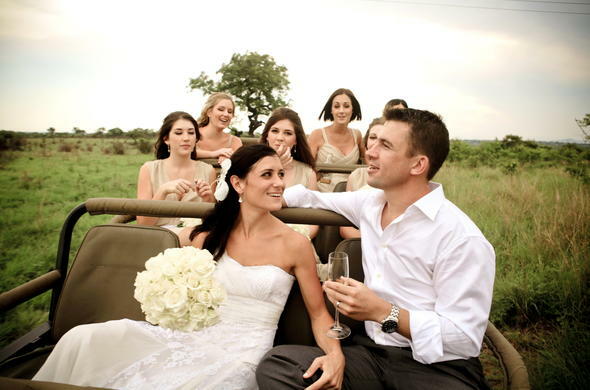 On a 3 Day Romance under Canvas Package you can celebrate your love in a stunning setting alongside the Kruger Park at beautiful safari lodge in Sabi Sands Private Game Reserve, for two nights and three days of heaven. Your safari lodge sits like a jewel in the pristine wilderness of Sabi Sands Private Game Reserve at the edge of the Kruger National Park. Its lush lawns and classic colonial ambiance provide a luxury retreat for a romantic getaway. Superb central guest areas overlook the pool and floodlit waterhole. 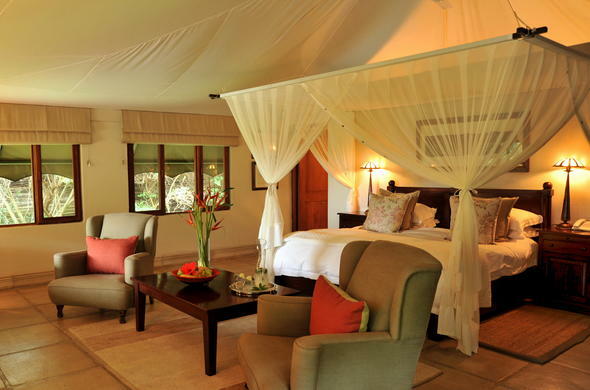 The elegant tented suites, some with private plunge pools, are nestled in surrounding indigenous bush and trees. The lodge also has a library and a well stocked wine cellar. 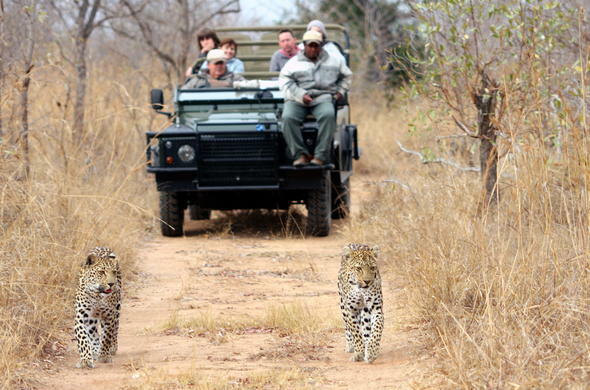 Sabi Sands Private Game Reserve is known as the Land of the Leopard. The emphasis at this Sabi Sands safari lodge is, first and foremost, on the safari experience and the activities of the many rare and beautiful creatures encountered. The area is studded with dams that attract large herds of game including the Big Five. On foot or in special game viewing vehicles, a safari will provide incredible photographs and unforgettable memories. A 3 day Romance under Canvas Package is a magical destination for couples and a great way to celebrate your honeymoon or anniversary. Depart O.R. Tambo International Airport, Johannesburg on a flight to a safari lodge in the Sabi Sand Private Game Reserve. You will be met by your ranger and introduced to the area. You have two nights and three days to discover the fine facilities at your disposal and enjoy luxurious, personal service on your luxury South African safari.Your safari lodge lies in an area where Big Five sightings are so frequent it is not unusual to see Lion, Leopard, Elephant, Buffalo and Rhino in a single game drive. Specially designed game viewing vehicles and highly trained guides with vast knowledge of the African bushveld provide amazing game encounters. The numbers of vehicles at game sightings are very limited, affording a truly exclusive experience. Game drives depart twice a day, in the early morning with a stop for snacks and coffee, and also in late afternoon with a stop for sundowners. Game viewing activity: Afternoon game drive. Relax in your luxurious suite and greet the day at leisure or rise at first light and join your ranger on an exhilarating morning game drive. You return later for a delicious breakfast. The rest of the day is yours to enjoy. You can set off on a guided bush walk, relax by the pool or arrange for a soothing in-suite wellness treatment. An extra romantic touch would be a private outdoor shower or a soothing bubble bath for two. Those who want to get out and about will find that exciting excursions like scenic tours, cultural interactions and Elephant back rides are arranged around game drives and meals. Golf is a full day affair at a nearby course.Gourmet dining is an essential component of the safari experience. Breakfasts provide full English fare plus fruit, yogurt, pastries, home-made mueslis and excellent 'smoothies'. Lunch is an innovative buffet with a variety of foods. Dinners are indeed a treat! Gourmet local and international fare can be enjoyed by candlelight on the main deck or under the stars around a blazing camp fire. Guests are often treated to the stirring voices of a local choir who entertain during dinner. Game viewing activity: Morning and Afternoon game drives. Optional bush walk. 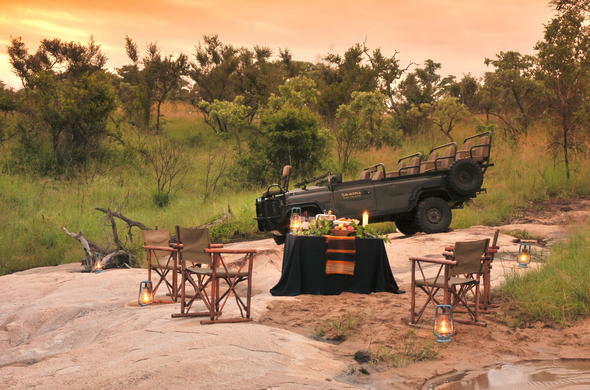 This is the last day of your luxury South African Safari in Sabi Sand Private Game Reserve. After a morning activity and breakfast your romantic break draws to a close. You will be transferred from the lodge to your flight for the return journey to O.R. Tambo International Airport in Johannesburg. Game viewing activity: Morning game drive. Round trip direct flights between Johannesburg O.R. Tambo and Kruger Mpumalanga Airport with road transfers between Kruger Mpumalanga Airport and the safari lodge.